In the complex terrain of creation, Alfredo Sosabravo has cultivated distinct specialties according to multiple action very difficult to find in the same individual. The artist’s production is vast and can be divided in two main parts. The two dimensional works which include paintings, engravings, collages, drawings and the three dimensional works which include ceramic, glass and bronze. 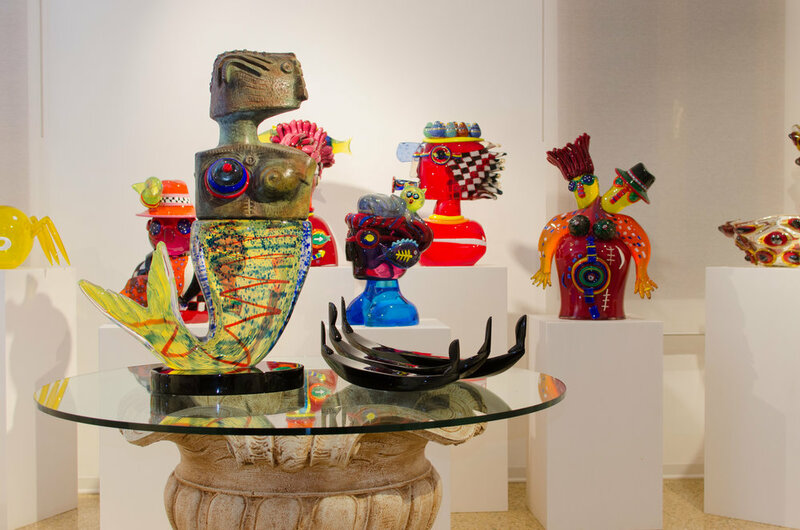 Sosabravo’s first glass sculptures are complex and original designs translated into transparent and colorful material. The themes are new, unusual in the artistic panorama of the Murano glass production. In the artworks is expressed an elaborate fantasy with a profound artistic maturity and their essence is extrapolated to materialize in the originality of Venetian glass. The result is exciting. As always, the glass masters and their compact team of well-versed artisans gave shape to an idea and a fantasy in incandescent glass that, with time, will clear the soul of fire forever. Only someone who has seen the frenzy, the heat, the atmosphere created when the flame is converted into an object of art can understand this fusion of creativity, of collaboration, of complete mutual confidence that unites artists of different cultures and skills who find their point of contact in a single expression.